Graffiti in an Omaha, Nebraska, alleyway in the US quoting Nobel Laureate Rabindranath Tagore left such a deep impression on Sean Penn that it was instrumental in his humanitarian and philanthropic activities. 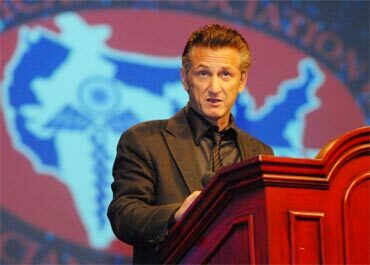 The mercurial two-time Oscar-winning actor, one of the keynote speakers at the American Association of Physicians of Indian Origin convention, acknowledged: "I would never have thought six months ago that I would be addressing 2,000 physicians of Indian origin." But he said, "There is a connection between my presence and all of you. I am not a religious person, but in 1989, I was working in Omaha, Nebraska, and everyday I would take the main road back and forth to the production offices of mine in a house that I rented by the University (of Nebraska). And there was an alleyway, and in that alleyway there was some graffiti and the graffiti said, 'Every new child born is proof that God is not yet discouraged of men.' That was the former poet laureate of India, Tagore, who'd written it (the original line)." To laughter, Penn noted that it had taken "some time to track down, but it made a very strong impression on me because it's a kind of fuel every time something like Haiti happens." In January, Penn flew to earthquake-ravaged Haiti and has been spending millions of his money and directing private relief operations there. Outgoing AAPI president Dr Vinny Shah told rediff.com that AAPI had prevailed on Penn to address the convention because "he is an extremely compassionate individual and he care for the poorest of the poor. His work in Haiti has been remarkable and some of our own Indian-American physicians have worked closely with him. That's why we worked overtime to get him to come and be our keynote speaker." "More important even than being a doctor is being good parents," Penn said. "And that's what the Haitian people want to do -- people who make $1 to $2 a day in Haiti, spend 45 percent of that on their children's education. Today 1.8 million of those people are displaced and so many in spontaneous camps that have no floors, that are contaminated mud with tarp structures made of deteriorating sticks. And the tarps themselves are deteriorating as we face enormous changes in weather, wind and rain. If you go to Haiti today, it is an impossible situation. It will never get better -- that's what you see. But that's not what your heart knows, because of the incredible strength of the Haitian people." Penn said he also went to Haiti "because of something else that happened in this last year. My son had to go through emergency brain surgery. He's fully recovered now but it was a very close call. And after signing death liabilities in a rush to get him into an operating room... post-op there was the pain -- the physical pain that's so tangible, that's so easy to see. So when the news reports come on, after my son had survived, after my son had been comforted by morphine, to see the reports where people, children (in Haiti), were being amputated without IV, pain medication, without anesthesia, all kinds of operations with all kinds of tools -- whatever was available -- the first thing that hit me was we got to get relief for the pain." He had immediately organised a large shipment of morphine. During that organising, "it struck me that we might be able to put a few people together because together we have seven doctors, 23 relief workers, and the idea was to go to Haiti. We had no infrastructure to go to Haiti but we were able to secure a landing slot with the help of the State Department -- once proving our manifest was valuable and our personnel valuable -- and we latched onto existing infrastructures." Thanking Indian-American physicians who had been part of his team and others working in Haiti, Penn exhorted more Indian-American doctors to go to that country and help out. "You know as doctors, everyone deserves medical care; and it's needed there. You are needed there. International doctors will be needed there for many years to come." He said that in Haiti, "I live in a world down there of incredible finger-pointing between government agencies and international aid agencies. So it's kind of refreshing to be speaking to a group like you -- to a group of medical professionals." He said that no one could say how long the rehabilitation and reconstruction process would continue but that one thing was certain, "There are lots of patients to be treated there. We need volunteers, we need expertise, we need money, we need you." Angelina Jolie to adopt child from Haiti? Sean Penn romancing Petra Nemcova?